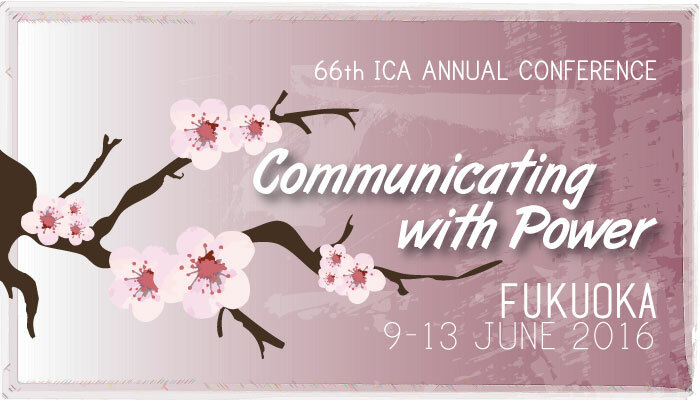 The 66th Annual Conference of the International Communication Association took place in Japan in the beginning of June. This year’s theme “Communicating with power” may be understood at two levels: communicating power is about communicating—both sending and receiving—powerfully or forcefully; and how can we make our research better understood by those with the power to use them for good. Of course, as one of Europe’s best programs in its field Communication Science at the University of Amsterdam was represented at the event with various papers and posters. Take a look at the topics below and find out how many awards did we won! Featuring over 2,500 academic papers on Communication and attended by over 2,300 Communication scholars across the globe, the ICA conference is the largest scholarly international communication conference in the world. This year the event was a great success for the Corporate Communication group as several team members received special recognitions for their professional efforts. Mark Boukes and Rens Vliegenthart were awarded first place in the Top Faculty Paper Award for 2016, “ICA Journalism Studies” division, for their paper “A general pattern of newsworthiness? : Analyzing news factors in tabloid, broadsheet, financial, and regional newspapers.” The research, based on the larger Vidi-project, deals with an investigation of news factors across different types of newspaper outlets. Additionally, three more awards were given in the category Top Student Paper for 2016. Ward van Zoonen won a Top Student Paper award, “Organizational communication” division, for his paper “Social Media’s Dark Side: Inducing Boundary Conflicts”. Anne Kroon and Toni van der Meer also won a Top Student Paper Award, “ICA Journalism Studies” division, for the paper “Who Takes the Lead? Investigating the Dynamic Interplay of Organizational and News Agendas”. Finally, Nadine Strauss won the Top Student Paper Award, “Philosophy, Theory and Critique” division, for her paper “Trust and the Financial Market in Light of Habermas and Luhmann: A Research Agenda for Communication Science”. More information about their researches can be found further in this article. For an inside look of the sessions we asked Martine van Selm, UvA College of communication Director, to tell us more about the event. She chaired a paper session within the Health Communication Division on “Social Support for Health”. Participants from Europe, the USA and New Zealand discussed how social support from online networks may contribute to positive health and health care outcomes. The online support groups were either initiated by the health care organization or by patients groups themselves. In another administrators’ meeting on “Leading Communication Programs in Higher Education” were discussed issues and themes that keep administrators at universities busy, such as starting interdisciplinary programs, curricula and didactics of the future, building sustainable connections with the professional field, and university politics. The most prevalent topic presented by the Corporate Communication group members was related to the connection between organizations and media and the effects of these relationships. News factors in the newspapers, trust in financial actors, institutions, and the financial system, the dynamic relation between organizational and news media agendas, the influence of press releases on salience organizations and news media’s reliance on press releases were part of the topics discussed. In the field of management of change and organizational culture were discussed the role of communication through the prism of a social enterprise systems when creating an organizational identity. Organizational communication was discussed by papers debating the double-edged sword of connectivity and the relation between work-related social media use and employee wellbeing, as well as the mixed media stereotypes about older workers. The topic of organizations and social media was presented through studies dealing with the impact of brand messages on social media on the receiver’s intention to spread them further as well as the relation between Dow Jones Index and tweets that imply relevance and convey an expert opinion. Below you can take a look at more detailed descriptions of the presented papers and posters. The study was part of interactive poster session. It presented a systematic investigation of news factors across different types of newspaper outlets. This was based on a large-scale content analysis of economic news. Driven by a lack of research on strategic financial communication, this paper aims at providing a theoretical framework on studying trust in the financial market from a communication science perspective. It is argued that the economic understanding of trust does not comply with the sociological definition of trust based on Luhmann. Recent developments on the financial markets suggest, however, a move towards a sociological understanding of trust. Originating from Habermas’ Theory of Communicative Action and Luhmann’s Systems Theory, a socio-systemic theoretical framework is drawn, based on which a research agenda for strategic financial communication emerges to study trust in financial actors, institutions, and the financial system. In order to offer conclusive evidence on the dynamic causal relation between organizational and news media agendas, this study introduces the crucial element of time. Results show that on the salience-level, organizational and news agendas are intertwined in an intimate relation of reciprocal influence, in which organizations take the lead. Conversely, on the sentiment-level, organizational and news agendas rarely influence each other. This implies that the unidirectional conceptualization of news media as a channel to vent organizational messages is too narrow. The paper was presented during “Mediatization, autonomy and public sector organizations” session. The study was part of “Interactive poster session”, Public Relations. In the paper was find an influence of press releases on salience organizations in the Dutch news. Results show that agenda convergence is higher for the national news agency ANP and traditional print news, while lower for online news. More or Less Diverse: An Assessment of the Effect of Attention to Media Salient Company Types on Media Agenda Diversity in Dutch Newspaper Coverage between 2007 and 2013. The study was part of “Interactive poster session”, Journalism. Company news can be seen as a zero-sum game: a trade-off between attention and the available news space. Attention to banks, and to lesser extent the automobile industry has a structural negative influence on media agenda diversity in Dutch news coverage of NRC during the economic crisis. But, the majority of other media-salient firm types have a significant positive impact on diversity. A Novel Approach to Assess Content Overlap between Large Quantities of Texts: Introducing Cosine Similarity in Communication Research. It introduces cosine similarity as a quantitative measure to assess the degree of frame overlap. A case study on the Dutch nuclear energy debate (2003-2012) shows that the cosine measure provides a good indication of content similarity. The higher the cosine score between two sets of texts, the more likely it is that there are corresponding frames. Subsidizing the News? The Role of Sources and News Agencies in the Production of the News. While the relation between PR-material and newspaper content has generated considerable attention, longitudinal evidence to substantiate claims of increasing journalistic reliance on subsidized content from the PR-industry is scarce. Finding no support for the claim of widespread copy/paste, or ‘churnalism’, practices, this study advocates a more nuanced view of news media’s reliance on press releases. The paper discusses the role of communication for organizational identity changes in the context of the Dutch social enterprise Fairphone, as the organization faces the challenge of gaining legitimacy for the way in which it combines commercial and social objectives or values into a hybrid organizational identity. It was found that the changing focus in Fairphone’s own framing of their identity acted as a double edged sword – that is, the initial issue-based framing around multiple social issues under the umbrella of a ‘fair’ phone brought on more people to join at first, although over time such mobilization faltered. Using the context collapse and work-life boundary theory, this article examines the relationships between work-related social media use and employee wellbeing. Through interactions on social media the world becomes increasingly connected. While organizations may benefit from this connectivity, it may also result in spillover effects between an employee’s professional and personal life domains, which may impose conflicts. In turn, social media have often been applauded for affording the ability to effectively managing demands from both life domains. This study shows that there is a dark side to employees’ use of social media for work as they experience work demands to be intrusive to their personal lives and vice versa. Hence personal social media use for work is a source of conflict for employees and is related to emotional exhaustion. Using an experimental design, this study examines how mixed media stereotypes about older workers affect the implicit activation and application of competence and warmth stereotypes of older workers. The results show that a newspaper article portraying older workers in a stereotypical manner, i.e., as high rather than low in warmth, and as low rather than high in competence, inhibits and evokes negative employability perceptions. Between Accommodating and Activating: The Role of Employment Policies in Framing Workforce Aging Across Europe. This study investigates sources of variation in visibility and framing of activating policy reforms in news coverage in the Netherlands, the UK, Denmark and Spain for the period 2006-2013. The results show that news representations that promote active aging are comprised during debates about unemployment, in conservative-leaning newspapers and in times of crises. The presentation was part of the “Advertising and Branding” session, “Information Systems” division. It discussed the impact of reading brand messages passed along by social media contacts on the receiver’s intention to pass along the message further, but also his or her attitude towards the brand. In this study 2,440 economic tweets from Reuters and Bloomberg were manually analyzed and Vector Auto Regression analyses were employed to investigate which dimension of economic news drives the stock market for different short-term intervals within a trading day. Results suggest that within 5-minute intervals, the Dow Jones Index is positively related to tweets that imply relevance and convey an expert opinion. This relationship flips within 1-hour intervals, showing the DJI to be negatively associated with news volume, relevance and expert opinion. The findings imply evidence for a myopic loss aversion, meaning that traders who receive more time and information to evaluate their decisions are more likely to react risk-averse. Controversy, Surprise and Negative Consequences: What Factors Make a Press Release Newsworthy?